From its introduction, Escalade quickly became the standard among luxury SUVs with a formula of bold design, powerful capability and luxurious accommodations for up to eight occupants. Three succeeding generations led luxury SUV customers to confer icon status on it. The 2015 Escalade takes design and technical elements from Cadillac’s product expansion to elevate the brand’s signature SUV. Offered with 2WD and 4WD drivetrains, Escalade features a new 6.2L V-8 engine that is more powerful and more efficient than previous models. Cadillac’s Magnetic Ride Control, the world’s fastest-reacting suspension system, is now standard and delivers precisely controlled driving performance. The exterior features crisp, new and more sophisticated surfaces, accented by dramatic light-emitting diode, or LED, lighting. The new interior features cut-and-sewn and wrapped materials, with wood trim options chosen for elegance and authenticity. Seats were engineered to be more comfortable and sculpted in appearance. The new interior is dramatically quieter, too, thanks to a stronger new body structure, new and enhanced acoustic material, and Bose Active Noise Cancellation technology. CUE, Cadillac’s advanced system for connectivity and control, is standard featuring state-of-the-art voice recognition with touch controls common with the world’s most popular tablets and mobile devices. A standard 12.3-inch digital gauge cluster can be reconfigured with four themes and an available head-up display projects information onto the windshield. An available Blu-Ray DVD rear entertainment system includes a nine-inch, roof-mounted screen on Escalade and two nine-inch screens on Escalade ESV. The front seating area offers more than 1.5 inches (44 mm) more headroom and more than four inches (101 mm) of additional legroom compared to previous models while the second- and third-row seats fold flat for greater cargo versatility – and a segment-first hands-free liftgate includes programmable height settings. Escalade’s new technologies include safety features to help protect occupants before, during and after a collision, such as Front and Rear Automatic Braking, which relies on short-range radar technology and ultrasonic sensors to help the driver avoid front and rear low-speed collisions via a progression of alerts that extend to complete braking, if necessary. Also new is the segment’s only Front Seat Center-Mounted air bag, which is engineered to provide additional protection to drivers and front passengers in far-side impact crashes, where the affected occupant is on the opposite, non-struck side of the vehicle. A Driver Awareness package includes Forward Collision Alert, Lane Departure Warning System, and the patented Safety Alert Seat, which offers directional vibrations to alert the driver about potential crash threats. A Driver Assist package adds Full Speed Range Adaptive Cruise Control, Front and Rear Automatic Braking, Automatic Collision Preparation and Automatic Safety Belt Tightening. Additionally, Side Blind Zone Alert, Rear Cross Traffic Alert and Lane Change Alert are standard on Luxury and Premium models. Real wood combined with premium cut-and-sewn materials and sueded accents, along with ambient lighting, were designed to add elegance to the interior design. Tight tolerances of the instrument panel and door panels, precision controls and triple-sealed doors were engineered and designed to reinforce a feeling of quality. The seats were designed to be more comfortable and sculpted in appearance with a reclining second row. The design incorporates dual-firmness foam that ensures long-trip comfort and helps retain appearance over time. Heated and cooled seats are standard in front and second-row bucket seats have standard heat. The available second-row bench has heated outboard seats now reclines. For the first time, Escalade will feature CUE standard. The eight-inch center screen uses capacitive touch technology and gesture recognition, enabling tapping and swiping common to smartphones and tablets. CUE uses proximity sensors to activate common options and controls as the user’s hand approaches. An expanded “favorites” section offers quick access to phone contacts, navigation destinations – even digital music – in the same one-touch form as traditional radio presets. The instrument cluster features a standard, reconfigurable, high-resolution 12.3-inch digital driver information center display paired with Cadillac’s CUE infotainment system. Key data also is displayed on an available, full-color head-up display. Along with vehicle systems information, the color driver information center also provides details on the audio, Bluetooth phone and navigation systems, and they can be easily adjusted via steering wheel controls. The headlamps incorporate the industry’s first Total Internal Reflection LED high-beam function, which consists of four vertically stacked crystal lenses and LEDs. The low beam consists of five crystal lenses and LEDs that create the light pattern. The Cadillac script is branded in the headlamp bezel. Tall, thin vertical LED taillamps reach to the top of the Escalade and feature the brand’s wreath-and-crest insignia, which illuminates in the dark. Escalade also features LED-illuminated door handles on the Premium Collection. New inlaid doors fit into the body side openings instead of over the top of the body, significantly reducing wind noise and contributing to improved aerodynamics that help the vehicles slip through the air on the highway with less wind drag. Active air shutters close in front of the condenser/radiator assembly at certain highway speeds to improve aerodynamics for greater efficiency. A lightweight aluminum hood and liftgate panels reduce overall mass. Body panel gaps are tighter throughout. The new liftgate is designed to be sleeker in appearance integrates the rear window wiper into the spoiler. 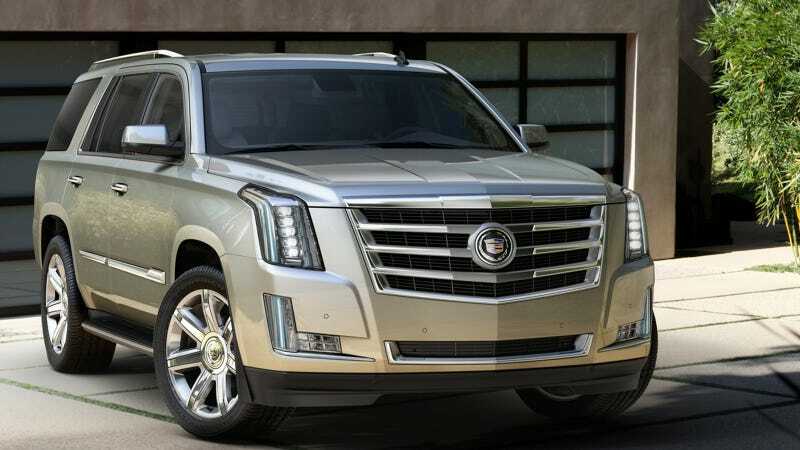 The performance threshold for the 2015 Escalade lineup rises with an all-new, more efficient 6.2L V-8 engine rated at an SAE-certified 420 horsepower (313 kW) and 460 lb-ft of torque (623 Nm) – a nearly 5-percent increase in horsepower and 10 percent more torque. The greater torque delivers an enhanced feeling of power on demand, particularly from a standstill and at low speeds. The new 6.2L features state-of-the-art technologies, including direct injection, Active Fuel Management, or cylinder deactivation, continuously variable valve timing and an advanced combustion system, designed to make the most of power, torque and efficiency across a broad range of operating conditions. More precisely controlled combustion enables Escalade to run with a higher compression ratio, which delivers greater power and greater expected efficiency. The engine is matched with the Hydra-Matic 6L80 six-speed automatic transmission with enhanced TapShift control. Escalade’s performance is channeled to a more sophisticated chassis and suspension system, engineered for a greater feeling of solidity and a quieter, smoother ride. A fully boxed frame – composed of more than 75 percent high-strength steel – is the foundation for its ride quality. New shear-style body mounts help reduce vibrations transmitted into the vehicle. Third-generation magnetic ride control is standard with Tour and Sport modes. Magnetic Ride Control is a real-time damping system that delivers more precise body motion control by “reading” the road every millisecond. Damping can go from full force to lowest force in a few milliseconds, or within three inches of road travel. It replaces conventional mechanical-valve shocks with electronically controlled shocks filled with a magneto-rheological fluid containing minute iron particles. Under the presence of a magnetic field, the iron particles align to provide damping resistance almost instantly. The new Escalade has been designed with greater security features to thwart theft attempts, including an intrusion sensor, inclination sensor and glass breakage sensors. Along with triggering the vehicle’s alarm systems, some of the features shut down key control systems to make it almost impossible to start or move the vehicle. The security features are supported by OnStar Stolen Vehicle Assistance, which can help police locate the vehicle.